Lake St. Clair, Thurston County, Washington. This contour map from Lakes of Washington (Vol 1, Western Washington). by Earnest E. Walcott. This book is also known as Water Supply Bulletin No. 14. The 3rd edition was published by the Washington Department of Ecology in 1973. This is a beautifully convoluted lake complete with four small islands (the dark areas on the map). "No one can say accurately how many lakes there are in Western Washington or the State as a whole. Man-made ponds, reservoirs, and natural lakes all form and disappear with surprising frequency..."
So says Ernest Wolcott, author of the Lakes of Washington, still the standard reference book on the subject. The first volume includes data and discussions of 3,813 lakes. Yes, that's right. And that number refers to inland bodies of standing water in the western part of the state that over one acre in area. It also includes all named lakes even if they are under one acre. Lake St. Clair is 233.1 acres is southeast of Olympia and is accessible for swimming, fishing, and boating from two public boat ramps managed by the Washington Department of Fish and Wildlife, which stocks it with rainbow trout, brown trout, and channel catfish. The lake also has naturally occurring populations of bluegill sunfish, largemouth bass, yellow perch, and black crappie. 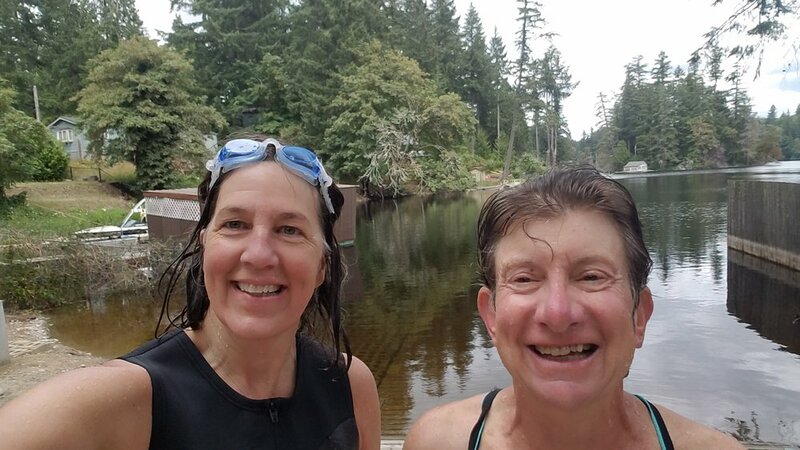 I was not there to fish but to swim in one of the 3,813 lakes in our state--one of the 108 lakes in Thurston County included in Lakes of Washington. Swimming in freshwater lakes is one of my favorite things to do though I didn't discover this until 2007, my first summer in Washington. A friend had mentioned Black Lake, the county's largest lake accessible through Kennydell Park. Compared to the YMCA lap pool where I usually swim, Black Lake was enormous, a little freaky (what's on the bottom of the lake? what's in the lake? ), and thoroughly exhilarating--especially when a bald eagle flies close overhead and lands one of the towering trees along the shoreline. I was hooked immediately and began seeking out lakes wherever I went. I always packed a bathing suit in my suitcase or backpack just in case. Knowing there were no snapping turtles or water moccasins in the lakes here (as there were back in the lakes in Virginia where I grew up) and knowing the risk of stepping on a sting ray or getting wrapped up in a jellyfish was zero (unlike in southern California where I swam in the Pacific), swimming in Black Lake and other freshwater lakes in Washington was liberating. Nothing was going to sting me, grab my ankle and yank me into the depths of the lake, or bite off one of my toes. Pretty soon I had bagged 22 lakes and was swimming from late April to early October. Well, jumping in and out quickly in April and October and swimming fully immersed and for at least an hour during the warmer months. Every lake has a story to tell. Lake St. Clair, for instance, was gouged out during the retreat of the Puget lobe of the Pleistocene-era Vashon glacier about 14,000 years ago. This glacier had covered the land from Canada south to southern Puget Sound with a sheet of ice 3,000 feet thick. Huge chunks of this ice, mixed with sand and gravel, detached from the ice sheet and became stranded as it retreated. The melting chunks of glacier formed depressions called "kettles" or "potholes." In the case of Lake St. Clair, this depression filled with water--currently to a maximum depth of 110 feet. 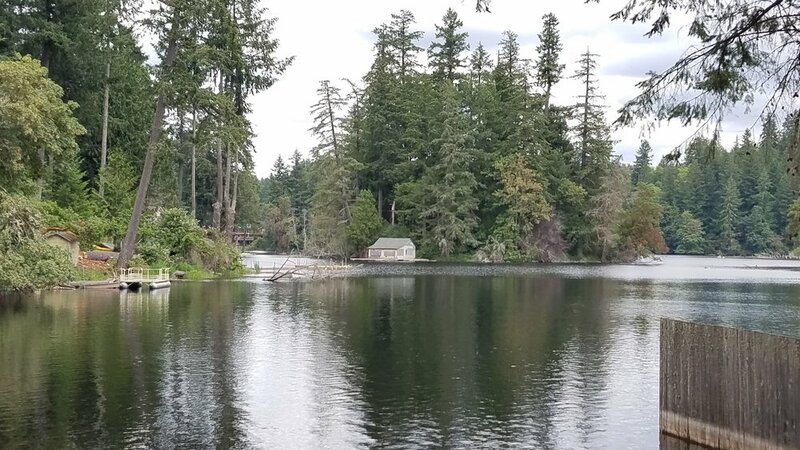 The lake is fed by Eaton Creek and drains to the Nisqually River. It is not a pristine wilderness lake, but one that is well-developed (with housing, especially on the south and west sides) and popular for recreation (fishing, swimming, boating--including higher speed motor boats in the large southern basin). On a weekday morning or cool overcast day, you can slip in to the quiet lake from the east boat ramp and think you have it all to yourself. A mysterious little seabird lured me to the West Coast in 2001. I wrote a book about this bird (Rare Bird: Pursuing the Mystery of the Marbled Murrelet). One of the nicknames of this bird is the "fog lark" because it flies in the early morning, often in the fog, along the Pacific Coast. After five years of looking up into the fog to spot one of these fast-flying birds, I turned my sights to the fog and the rest of the clouds that obscured the murrelets. I spent many afternoon floating in my neighborhood lakes looking up at the clouds and pondering the water cycle. Last September, I published A Sideways Look at Clouds, a work of narrative non-fiction. And now, after studying the clouds while floating in water, I am turning my attention to the water--to the lakes themselves to see what I can discover about the lacustrine loveliness of my home landscape. One of two public access points to Lake St. Clair leads you toward a small island (private property--humans and bald eagles)--one of four little islands in this irregularly shaped lake with many narrow arms to explore. You need a Discover Pass for parking at either boat ramp area. More info on access here. Sure, we're smiling now but we were not so happy getting ourselves into the lake on this brisk day in "June-u-ary."